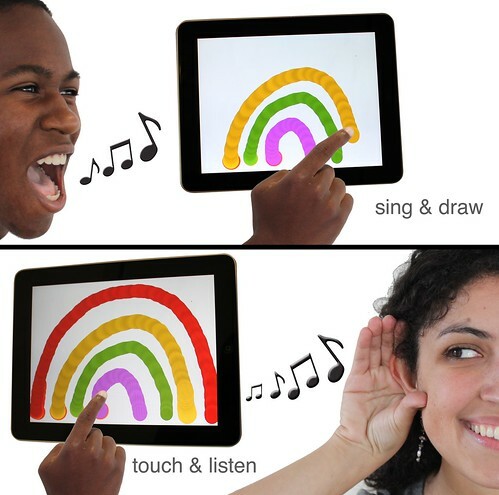 Make a sound while moving your finger to record a sound-drawing. Touch the drawing you just made to play the sound back: forward, backward, sideways, or any way. That's it! Singing Fingers lets you see music, hear colors, and re-see everyday sounds for the beautiful playground that they are. Singing Fingers lowers the floor to let beginners play with sound as if it was finger paint, and raises the roof by letting advanced DJs break out of the grooves of the records into a world where sounds take any shape you give them. Your own fingers are like the needles that play the sounds back. Just like records and tape recorders were breakthroughs in simplicity and power, Singing Fingers has no complex buttons, menus, or rules. One simple medium, one simple touch of the finger, millions of possibilities. Tap the keys of a piano or sing a scale while dragging your finger on the screen, and you'll have just drawn your first playable musical instrument. Tell a story while drawing the story on the screen. 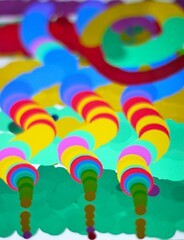 Explore a sound in the world, like rain or thunder, visually and see what it sounds like forwards and backwards. Use your voice as the "paint" to draw a picture. Laughter and yelling gives dozens of colors, while whistling a note can give you a specific color. When you holler out and move your finger around on the screen, Singing Fingers turns the sounds into a concrete visual object. By transforming the pitch of the sound to a color and smearing it across the screen, people can learn to "see music" and "hear colors." What is sometimes referred to as "synesthesia" or "cross sensory thinking" becomes an everyday part of playing with sounds. One of the goals of the people behind Singing Fingers is to help people to see the invisible and re-see the everyday world as the beautiful playground that life is. A long time ago, only advanced technicians with handmade machines could record sounds. Exciting advancements like record players and tape recorders meant more people could play and record sounds, while cultural revolutions like scratching records and making summer mix tapes meant more people were mixing and remixing music. Computers have opened up many new ways to play with sounds, but none have been as huge a leap for people's expressiveness as we would hope for: iPods let you play music, complex software lets you mix it together, and simple programs let you record sounds, but where is the big leap forward? We see Singing Fingers as a step toward the next big cultural transformation, putting all the power of recording, playing back, and remixing, literally at the tip of the finger for the most improvisational, fluid, sound interface we could come up with. Singing Fingers lowers the floor to let children play with sound as if it was finger paint, and raises the roof by letting advanced DJs break out of the grooves of the records into a world where sounds take any shape you give them and your fingers are like the needles that play the sounds back, with as fine control as your hand will allow. The scratching of records, the recording of tapes, the visualization of the graphics equalizer, and the remixing power of computers, in one little app that takes seconds to learn and years to master. This is a Flickr badge showing items in a set called singing fingers upclose. Make your own badge here. To hear about future releases sign up for the low volume announcement email list by sending an email to with the word LIST in the subject. 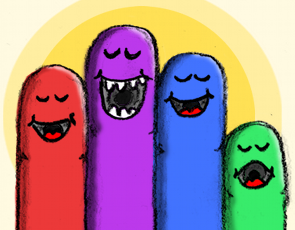 Singing Fingers was designed for the iPad, but also works with the iPhone. The iPad BETA version will be released any day now. We're excited about the basic design, but there are lots of features we want to add, which is why we consider the current release to be a BETA release. Here are the features we are thinking we want to add before releasing version 1.0: Looping and automation, recording and sharing, sound tweaks and other glitch fixes. We have also received suggestions, which we take seriously, like adding a toolbar to modify sound-objects and delete or move existing sound-objects. Please keep the suggestions coming. By Eric Rosenbaum and Jay Silver of Beginners' Mind. Support from MIT Media Lab's LLK. 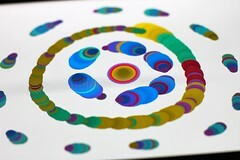 Made with OpenFrameworks. Some inspiration from a brainstorm with Josh Gordonson and Amos Blanton. Concept collaborators include Amos Blanton and his early work on "Sing Painter." Also check out our new MaKey MaKey project! "What if you could see a sound?" "It seems totally mad, 'til you see the video." "Think of all the awesome stuff you could do with this." "...like a sort of voluntary synesthesia." "DJs could make -- and scratch -- their own iPad records." "Singing Fingers has a dead simple interface"